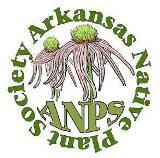 Field trips of the Arkansas Native Plant Society are for current and future members. (That’s right: Everyone is welcome!) Botanists from around the state lead these enjoyable and informative walks. Uncertain of the weather? Call the trip leader. Sunday, April 14, 12 noon (or 11 a.m.). Cossatot River State Park. Leader: Brent Baker. Join Arkansas Natural Heritage Commission botanist Brent Baker for a nature walk on Harris Creek Trail at Cossatot River State Park-Natural Area. If you eat lunch on the way, meet at the Visitor Center at 12 pm. Or if you want to bring a sack lunch, you can arrive at 11 am and eat with Brent at the Visitor Center and then take a quick stroll on the Waterleaf Interpretive Trail. The Visitor Center is on south side of US Hwy 278, a little over 9 miles east of junction with US Hwy 71 in Wickes, south of Mena and north of DeQueen. If coming from Little Rock, take US Hwy 70 west out of Hot Springs to Salem, just past Glenwood, and then take AR Hwy 84 west to junction with US Hwy 278 at Umpire. From there it’ll be a little over 8 miles west on Hwy 278 to the Visitor Center. Allow for a good 3-hour drive from Little Rock. After meeting at the Visitor Center, we’ll then drive the 1.3 mile to the trailhead. Harris Creek Trail begins in a shale glade just above Baker Creek. (The creek and the now defunct Baker Springs community just upstream are actually named after Brent’s ancestors who settled here in the mid-1800’s!) After exploring the spring wildflowers of the shale glade, the trail meanders through various dry to moist mixed pine, hardwood, and cedar woodlands with a high diversity of plants, including several rare plants. Highlights will include chalk maple, Ouachita twistflower, Waterfall’s sedge, Palmer’s cornsalad, and probably several others. There are numerous overlooks with beautiful views of Baker Creek, Harris Creek, and the Cossatot River. The trail is 3.5 miles long and moderately difficult in short stretches. It’ll probably take us about 4 hours to hike the entire loop. Wear good shoes, bring lots of water, and perhaps a light snack. Folks who are headed back to Little Rock, if interested, can stop and eat dinner in Glenwood with Brent who will be staying there overnight. Please let Brent know you will be attending by Friday, April 12th so he will be expecting you. Also, provide him with a phone number so he can contact you in case of weather cancellation. Email Brent at brent@arkansasheritage.org or call 479.970.9143. To find out more information about Cossatot River State Park-Natural Area, visit the Arkansas State Parks website (http://www.arkansasstateparks.com/cossatotriver/) or the Arkansas Natural Heritage Commission website (http://www.naturalheritage.com/natural-area/cossatot-river-state-park-natural-area/). This entry was posted in Field Trips and tagged Arkansas Native Plant Society, Arkansas Natural Heritage Commission, Brent Baker, Cossatot State Park. Bookmark the permalink.